This is probably one of my best loved quilts, really I should say best USED quilts. It is also one of the first quilts that I had machine quilted in a wonderful all over snoopy loop design. At the time commercial machine quilting was fairly new. Machine quilting and the talented machine quilters have single handedly reinvented the art of quilting. Machine quilting has also helped facilitate making more quilts. Thank you for that!! The strips are 1″ finished. The layout of these blocks is done in a big barn raising style. The border is a mission valley woven. Traditionally the center of log cabins were red or yellow representing love or warmth in the home. 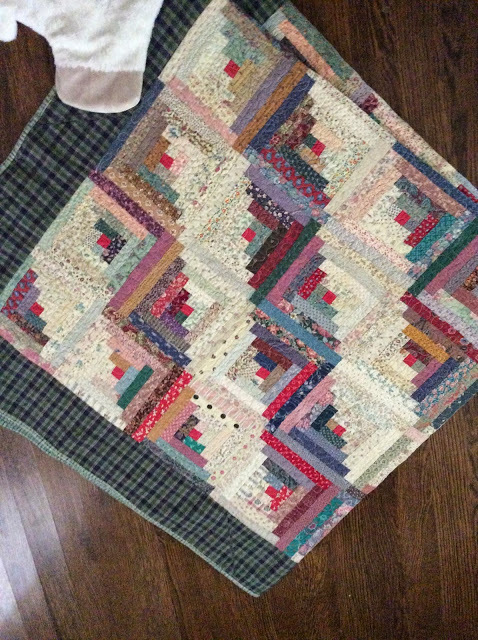 A friend of mine hung this quilt in her den for years. She needed something to cover the wall while decorating for a party and we both thought this quilt was just the thing. Since her home was like my second home the quilt stayed there for years until I pointed out to her that the corner of the quilt still needed the binding sewn down. Since then this quilt has been on many a family picnic, fort building adventure and now resides as a play mat for my little grandson. Another tidbit about this quilt is that I used all kinds of fabrics. 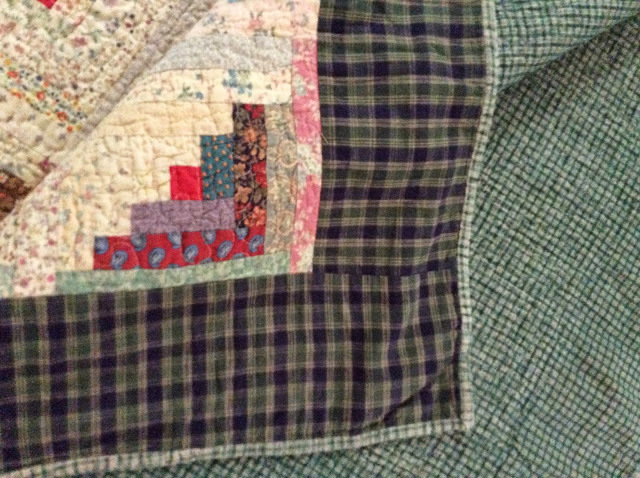 In the 80’s I was a young mom and a fairly new quilter. There were not very many quilt stores around at this time. I would go to any fabric store and buy fabric by the inch. Can you believe that? That would be insane now. I would go and buy a few inches of as many different fabrics as I could possible find. Since the selection was limited this also meant that not everything matched or maybe I was not yet very confident in my color choices or both. I sent the quilt top to a machine quilter in another state. This was in the early eighties and keep in mind, the quilting resurgence started in 1975. There were not many quilt stores, and there certainly were not many home machine quilters. I found a company that quilted fabric for those big puffy bedspreads. I convinced them to quilt my patchwork and NO, I did not want 3″ tall batting. I am sure they thought, oh this poor young thing, she has no hope or sense of color. You could possibly say this was the beginning of my love of jelly rolls. And I do still love to experiment with bleaching and dyeing fabrics!! What a wonderful quilt. 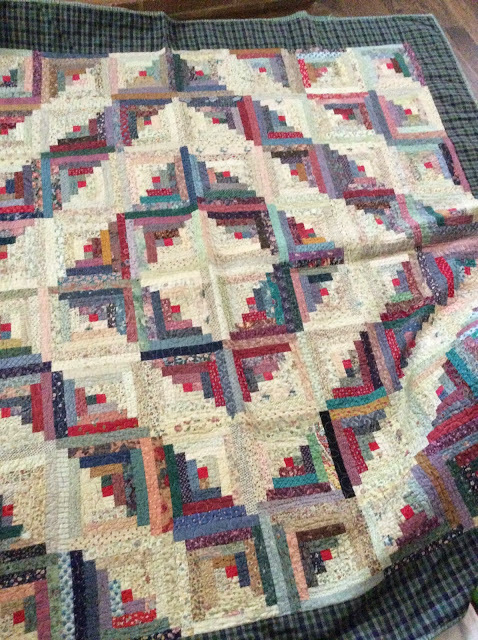 Probably my favourite pattern is the Log Cabin quilt. I love reading these kinds of stories. The girls that started quilting back in the early 80' s have a lot of interesting tidbits of information….like how I cut an entire full size quilt for a trip around the world with scissors…..
Love this trip down memory lane! Log Cabins have always been one of favorites and I have made a few! Your fabrics are so typical of the 80's ! I began quilting in 1976. What I remember from those 'dark' ages is that we had no rotary cutters, no acrylic templates and, worst of all there was so little cotton fabric was available! It was all those nasty poly cottons in fabric shops (no quilt shops either!). What wonderful changes have we have enjoyed! 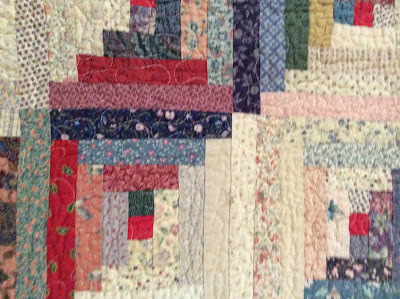 Love this quilt story Lissa! It's always fun to hear the story behind the quilts!